Vegas is all about being unconventional. Nobody knows this better than marriage-minded visitors. More than 80,000 couples come to Sin City to get hitched each year – in part because it’s so easy to do. As long as both of you are at least 18 years old, a marriage license is the only document you need. No blood tests are required. No waiting period is needed. Just give the county clerk’s office $60 in cash and you’ll be on your way to wedded bliss. The big question is how will you tie the knot? Many offbeat brides and grooms are ditchin’ tradition in Vegas. They don’t want to walk down a rose petal-strewn aisle. They’d rather break molds to begin their excitement-filled lives together. So for couples thinking outside the box when it comes to settling down, we’ve listed 10 wild and crazy ways you can get married in Sin City. From jumping out of a plane and diving underwater to, well, everything and everywhere in between, we’re certain that however you choose to say “I do” in Vegas, your big day here will be the first of many big adventures together. 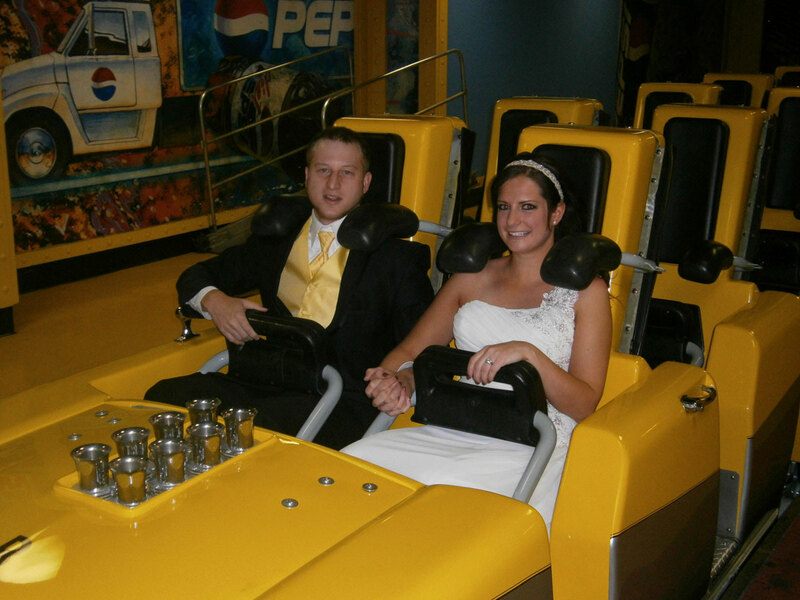 Newlyweds celebrate their wedding by taking the ride of their lives on the Big Apple Coaster at New York-New York. Photo courtesy of MGM Resorts International. Marriage is a roller coaster of sorts so what better way to begin your lives together than with a tumultuous ride on the Big Apple Coaster at New York-New York? Now you won’t take your vows while looping around (you’ll be too busy screaming for that). A wedding ceremony is held on the platform before you and your newly betrothed are strapped into the front seats of this stomach-churning roller coaster. Then you’ll be off on a rip-roaring ride that will have you twisting and turning, doing corkscrews, dealing with a 144-foot drop and bulleting through a 180-degree heartline spiral. Believe us, if you can survive these highs and lows, you can survive anything. Ceremonies cost between $600 and $700. Skydive Las Vegas lets couples take their love to new heights and mix the rush of tandem skydiving with wedded bliss. Photos courtesy of Skydive Las Vegas. Are roller coasters too tame for you? Skydive Las Vegas can help daredevil couples take the most literal of leaps into married life. Imagine saying “I do” in a PAC 750 XL aircraft while traveling to an altitude of 15,000 feet. After you seal the deal with a kiss, you’ll step out of the plane (attached to a tandem instructor, of course – because you’re crazy, not suicidal). While freefalling at 120 to 140 mph, you’ll see incredible views of Hoover Dam, Lake Mead, the Colorado River and the entire Las Vegas valley. You can’t begin to imagine how beautiful the backdrop in your wedding photos and videos will be. Contact Skydive Las Vegas at (702) 759-3483 for detailed information about pricing. 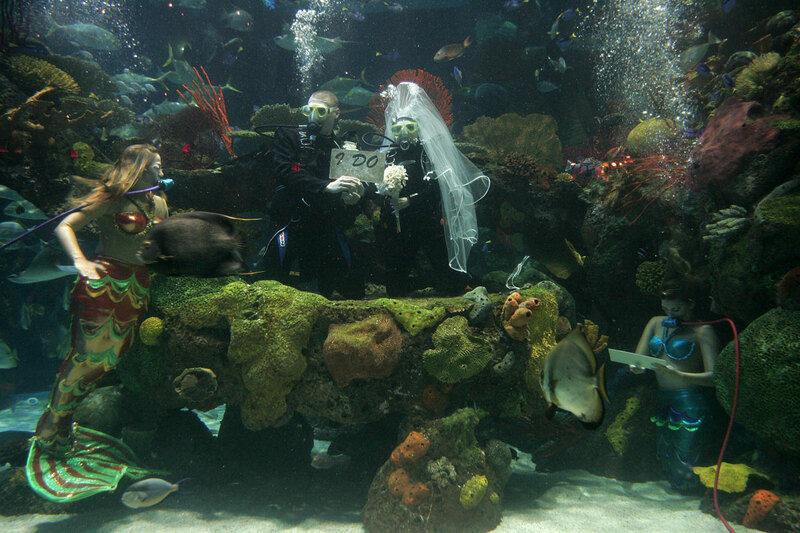 A wedding held in the Silverton’s saltwater aquarium is sure to start your union off swimmingly. Photo courtesy of the Silverton. The Silverton’s Underwater Wedding package gives new meaning to the phrase “taking the plunge.” Couples who are at least pre-certified in scuba diving can get hitched in the resort’s 117,000-gallon saltwater aquarium surrounded by 4,000 colorful guests (warning: they drink like fish). Your vows will actually be exchanged below the surface. All the gear and, thankfully, a full safety team are also provided. If you want to wear traditional attire, the groom’s jacket as well as the bride’s dress and veil can be weighted. And obviously, the bride will be accompanied by mermaids instead of bridesmaids. The cost for the Underwater Wedding package starts at $5,000 and includes a one-night hotel stay along with an underwater ceremony rehearsal (because a little practice is a good thing when sharks and stingrays are involved). You can’t get married at sea in Vegas. 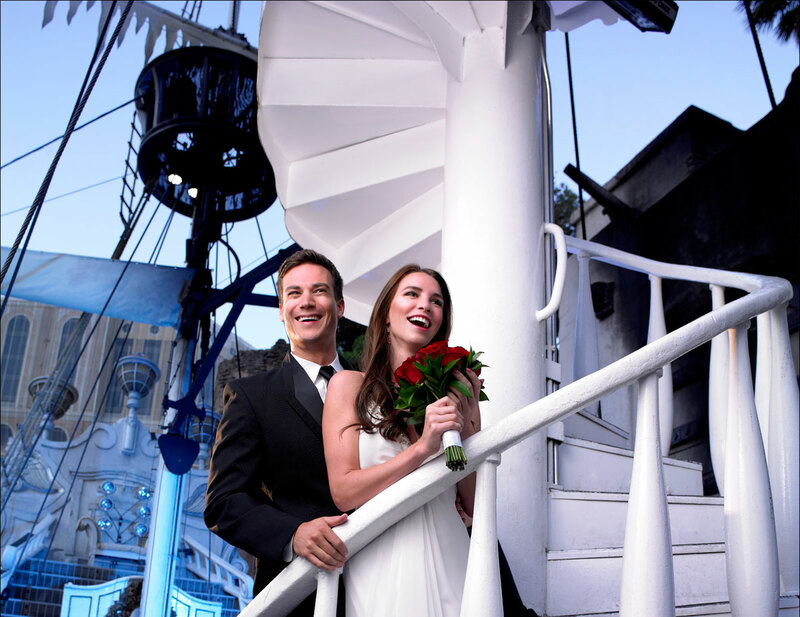 But for a nod to the nautical, you can get married on the Song Ship in front of Treasure Island. Photo courtesy of Treasure Island. Men, when you told your buddies you were getting married, did they make some joke about walking the plank? It’s a popular euphemism, we know. Although the pirate theme isn’t as prominent as it once was at Treasure Island, there are a couple of majestic ships that look like they’ve sailed the high seas in the Disney-esque manmade cove at the front of the resort. There are two wedding packages offered: Ever After on the TI Song Ship and Enchantment on the TI Song Ship (prices start at $1,675 and $3,475, respectively). Both are more elegant than swashbuckling. But even though you won’t be walking a plank, you will stroll over a boardwalk built from wooden planks when you get on board. Plus, you’ll be able to tell everyone back home you got married on a ship that was anchored near the heart of the Las Vegas Strip. The “family” requests your attendance at weddings held at The Mob Museum. Photo courtesy of The Mob Museum. 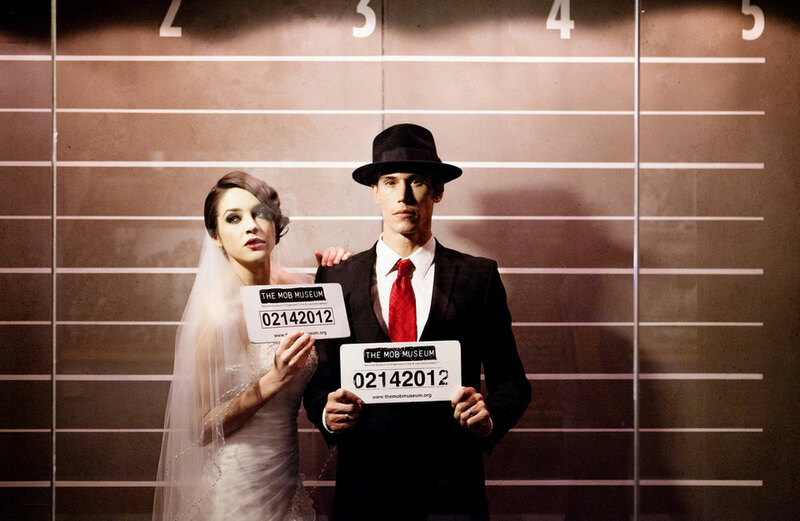 A mafioso-themed wedding at The Mob Museum (aka the National Museum of Organized Crime and Law Enforcement) in downtown Las Vegas is the perfect way to welcome each other into “la famiglia.” If you and your sweetie have been gunning for something with a little more style and weaponry (think fedora hats and bullet holes), then this is the historic venue for you. Originally built in 1933, ceremonies are usually held in the second-floor courtroom where the famous Kefauver Committee hearings to expose organized crime took place. Afterward you and your guests can mix and mingle right in front of exhibits that include the St. Valentine’s Day Wall where a gang was massacred in Chicago and the barber chair where Albert Anastasia was sitting when he was murdered in New York City. Wedding packages range from the Daytime Quick Wedding to The Big Italian Wedding, featuring the aforementioned fedoras along with an Italian-themed buffet, a logo Mob Museum bottle of Cabernet and a souvenir wedding certificate signed by former mob lawyer and mayor Oscar Goodman. The NRA would strongly approve of shotgun weddings at The Gun Store because they allow couples to seal their vows by firing off machine guns. Photo of Jason and Alta’s 2012 nuptials courtesy of The Gun Store. If you’re interested in shooting a gun, well, that’s another type of wedding altogether. Fortunately, The Gun Store has you as their target. This indoor shooting range offers “shotgun weddings” that allow you to…surely, you’ve guessed…pull the trigger on some exotic firearms. Packages start at $450 and include complimentary gift bags, signature hats and T-shirts, five rounds each on a shotgun and unique photo opportunities. 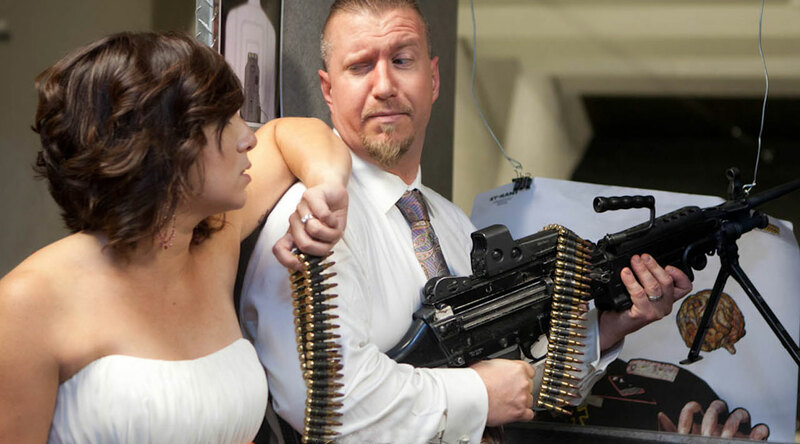 The gun-happy twosome can walk down the aisle in an on-site chapel that boasts prop guns on the wall while the sound of live machine guns firing echoes in the background. No matter what, your nuptials are sure to be a bang. 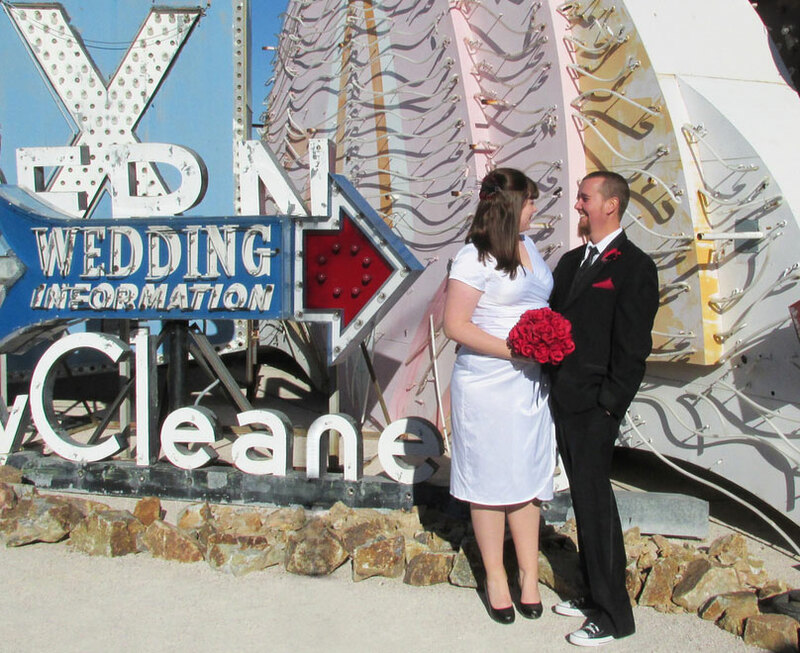 A restored Wedding Information sign at The Neon Museum offers a romantic photo opp. Photo courtesy of The Neon Museum. Neon gives off a distinct glow…and so do loved-up pairs pledged in marriage. So it just makes sense – like a scientific law – for couples to be united in a place that pays tribute to one of the noblest of noble gases. The Neon Museum has an outdoor exhibition area called the Boneyard that’s home to more than 150 historical and artistically important signs. Out here you can choose to say “I do” near a restored Wedding Information sign, the space-age Stardust sign or the Moulin Rouge sign whose dismantled letters spell out “in love.” There are other opportunities for ceremonies and receptions available in the museum’s North Gallery (where you’ll find a symbol of good luck in the oversized horseshoe from Binion’s Horseshoe casino), the nearby Neon Boneyard Park and the La Concha Visitors Center. Prices for weddings start at $450. 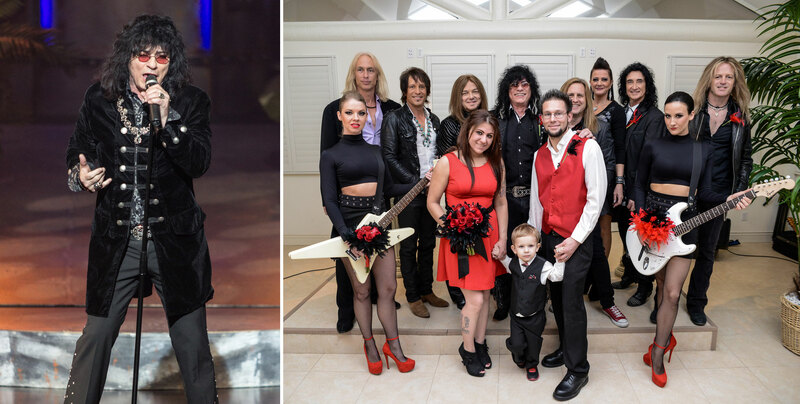 When he’s not performing in the showroom, Paul Shortino (left), the lead vocalist of “Raiding the Rock Vault” at the Tropicana Las Vegas, performs rock weddings (right). Photos courtesy of Tropicana Las Vegas. Forget the minister. Get married by a rock star. As part of the Rock Star Wedding Package at Tropicana Las Vegas, you’ll be joined in holy matrimony by a celebrity officiant – Paul Shortino. An ’80s icon and the former frontman of Quiet Riot, he now stars in the Tropicana’s headlining show “Raiding the Rock Vault.” A fully ordained minister, Shortino said, “Whether couples are embarking together on the journey of marriage or looking to renew their vows, I want to make sure it’s a ceremony they will remember for the rest of their lives.” The Rock Star Wedding Package starts at $1,399. If you book it, you’ll receive VIP tickets to “Raiding the Rock Vault,” along with lots of extras sure to rock your world – like limo service, rock ’n’ roll ceremonial music and much more. From left: A happily married couple ready to “Rock and Roll All Nite,” a look inside the Hotter Than Hell Wedding Chapel and a rock star-worthy cake with flames. Photos courtesy of KISS Monster Mini Golf. Attention hard rock and miniature golf lovers: why not combine two things you love into one by getting married at KISS Monster Mini Golf? Located across from the Hard Rock Hotel & Casino, this fun attraction is home to the Hotter Than Hell Wedding Chapel. It boasts a big stage fashioned after KISS’ album cover for “Love Gun,” complete with theatrical lights and smoke from a fog machine. Instead of a wedding coordinator, you’ll have a “tour manager” to take care of all the details. And you’ll be provided with “concert tickets” as invitations to send to your guests. Packages range from The Magic Touch for $249 to the Black Diamond for $575. You can opt to have a Gene Simmons or Paul Stanley lookalike officiate the ceremony. There are also lots of options in terms of rockin’ cakes and wickedly cool flower arrangements (think roses with black tips). Anything goes with the Las Vegas Wedding Wagon – including weddings on open-top, double-decker buses, in front of the Welcome to Fabulous Las Vegas sign dressed as lobsters or at the Pinball Hall of Fame. Photos courtesy of the Las Vegas Wedding Wagon. The Welcome to Fabulous Las Vegas sign, Red Rock Canyon, the Fountains of Bellagio, The Mirage volcano…and the list goes on and on. Take your pick. That’s the way it works with the Las Vegas Wedding Wagon. Packages start at a mere $129. And as the word “wagon” implies, they’ll arrive in a van filled with everything from the officiant, a photographer and a witness (if needed) at the location of your choice. Now this is where things get fun because some of the options are really unusual. Pinball fanatics might want to walk down the aisle of the Pinball Hall of Fame, where everyone will be given quarters to get their game on after the ceremony. History buffs might want to pledge their troth at the old West chapel on the grounds of Bonnie Springs Ranch. Or our favorite idea involves loading all of your guests into an open-top, London-style bus for a hop-on, hop-off wedding ride through Sin City that no one will ever forget. Ben and Jamie soar into the brave new world of marriage on SlotZilla’s zoomline. Photo courtesy of vegasexperience.com. OK, so you can’t get married on SlotZilla at Fremont Street Experience. But nothing’s stopping you from getting hitched at a nearby chapel in downtown Las Vegas (there are loads of them) and then taking flight with your one and only. That’s exactly what Ben and Jamie from Oregon did above – and we think that’s awesome. On SlotZilla, you have two takeoff options: the lower zip line, which is 77 feet high and involves wearing a traditional harness, and the upper zoom line, which is 114 feet high and requires you to fly face-down like a superhero. Granted this is difficult to do in a tux and wedding gown…but you should go for it because a couple that hangs together is sure to stay together.